Why belly bind after birth? Wrapping the abdomen in a bind (such as our Bengkung Belly Bind) after birth is thought by many to be an important part of your overall recovery. It aids the body to shrink and recover in a shorter time period- usually within 6 to 12 weeks. Support to the pelvic area is very important in the immediate weeks after birth as the body goes through significant changes during both pregnancy and labor. Each wrapping session includes education on the traditions surrounding Bengkung Belly Binding and I take great care to honor and give thanks to the Malaysian culture this style of binding is rooted in. In addition, I have committed to giving a portion of my profits from binding each year to a charity benefiting Malaysian families. "I love my belly bind. Its so comfortable and pretty. It was one of the only things that helped my diastasis recti issues I had after my twins were born." Can I use my belly bind during pregnancy? Absolutely. Many people enjoy wrapping during pregnancy. It can help support the hips, pelvis and back, and provide some comfort for a variety of pain issues such as sciatica, groin and lower back pain. When wrapping a Bengkung Belly Bind on a pregnant person I take care to wrap in such a way that there is no tightness over the bump. Plus, if you learn to wrap during pregnancy you'll be able to carry that information over to when you're postpartum too! There are many binds on the market. Why not just buy a cheaper bind from the baby store? Bengkung belly binds have several advantages over store bought binders. The longer design of this post-pregnancy wrap (13-19 feet of muslin) provides a holistic support to all of the abdominal and pelvic organs and muscles, and supports the pelvic floor. A Malaysian style bind is designed to start under the pecs and continue down to the pelvic area. 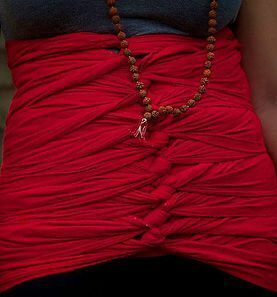 Traditional store bought binders are usually too short and do not hold the pelvis, and because they are typically made from stretchy material they do not provide the 360 degrees of support of a hand-wrapped bengkung bind. Think of it like the difference between buying a just for show corset from a chain store, vs a handmade reenactment renaissance corset. The difference is marked in both comfort and effectiveness, especially when we are talking about supporting our bodies after birth. 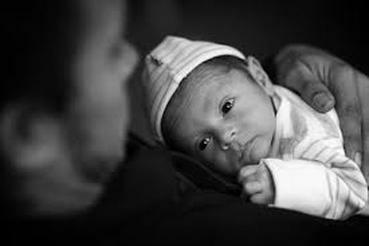 Can I belly bind after a cesarean section? Yes, absolutely. Once it has been four to six weeks after c-section, you can enjoy the benefits of belly binding. The time range accounts for different speeds of healing and your own comfort level. It doesn't matter if you labored before your c-section or not. Your body carried life for several months and the changes within will need some healing. 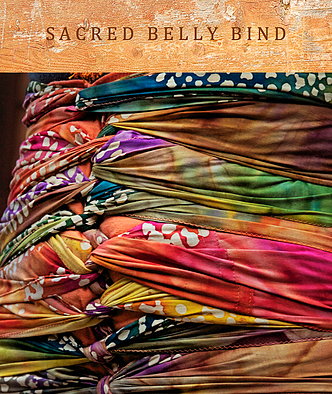 Belly binding after c-section is a great way to honor your journey and help your body heal. How long should I wear my bind? Wearing your wrap for 10-12 hours a day is the biggest help for healing. However, shorter periods of time can also be beneficial. During pregnancy you'll want to wear your wrap for much shorter periods of time- usually not more than five hours in a row. Is belly binding appropriate for birthing people of all genders? Whether you are in a female, male, transgender, non-binary, gender non-conforming, or really any "I just gestated" body, belly binding after birth can help you. It provides the body with 360 degree support to assist in abdominal wall muscle retraction, stabilize loosened ligaments, and provide support to the torso. It can aid in supporting your vital organs returning to their non-gestating size and position more quickly than without this support. If you'd like, you can couple the belly bind with the chest bind of your choice. When worn as an under-layer the bind can help with maintaining more of a flat appearance. For some folks the bind can help minimize the feeling and/or length of dysphoria, both while being worn, and because of its ability to support a speedier return to a non-gestating body. Your comfort is really important to me, so feel free to ask questions and I will answer them with kindness and humility. Where do you offer belly binding? All parts of Morris County, including Morristown, Mount Olive, Denville, Chester, Dover, Parsippany, Rockaway, etc. All parts of Warren County, including Allamuchy, Belvidere, Blairstown, Hackettstown, Hope, Independence, Phillipsburg, White Township, etc. All parts of Sussex County, including Andover, Branchville, Byram, Hopatcong, Lafayette, Newton, Sparta, Stanhope, Vernon, etc. If you are outside of the Skylands NJ area and would like to schedule a binding session please contact me. Travel fees may apply but I'm a kind human, and if you want me there and I can help you I will. How much does belly binding cost? $75 for one 45-60 minute wrapping and instruction session with client provided wrap. $260 for three wrapping and instruction sessions, one natural muslin wrap and herbal tummy paste included (+$20 for colored wrap). These can all be postpartum or be spread out between pregnancy and postpartum sessions.